Tell them about how, when you were young, you had a boyfriend who lived 45 minutes away. That was a long-distance call, so it was Very Expensive to talk on the phone. For that reason you only called one another on weekends, and during the week you wrote each other letters. On paper. Yes. This was 1991-1992. Twenty years ago. Last night we went to a release party for a viral video. How 2011! A friend of ours wrote a book to which the video is a companion piece. Anyway, at 53 seconds in, I work in the building on the right. Great, now we have to worry about pig MRSA. This week in Science, we learn that there has been pig to human transmission of a methicillin resistant Staphylococcus aureus (MRSA). While the pig MRSA hasn't been shown to be transmitted human-to-human yet, S. aureus is adept at horizontal gene transfers that can give it new capabilities. 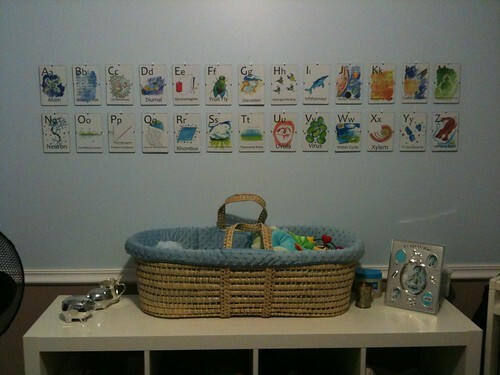 The awesome flash cards she gave Nate are finally up in the nursery! I noticed this box in my ersatz lactation room. I found the idea of the "friendly snorkel" too intriguing not to investigate. Alas, plain old canned air with a plain old red straw for the nozzle. What's so super friendly about that? Today Nate is a month old! It's almost impossible to believe. He is doing extremely well. At his last doctor visit he was already 11 lb. 5 oz. What a big boy! He has outgrown all his newborn clothes. In the last few days he's been producing fleeting but genuine-looking smiles. Parenthood is still pretty surreal. It's amazing how all-consuming a newborn is. I really thought I would be able to do other things while he napped, but no, not so much. He only naps really well if I'm holding him. Even getting a shower is often a challenge when I'm home alone with him. I would not have thought it possible to function on as little sleep as I've been getting, but I mostly feel pretty good. I do try hard to nap when he naps, which is not so difficult. Yesterday was our one really bad day so far--I think Nate and I were both over-tired and we both melted down. We slept better last night and are having a fine day today. Weirdest baby moment--at our last pediatrician visit, the doctor milked the baby! Due to the cocktail of my hormones coursing through him, he was lactating a little. The doctor expressed a couple of teaspoons of milk from each of the baby's breasts. Apparently it's sometimes called witch's milk. On Thursday the 25th I was 40 weeks and six days pregnant. My weekly midwife appointment was scheduled for that morning. Everything was going well, but on Friday I was going to be officially "overdue". The midwife offered to strip my membranes to try to get something started, and I agreed. (I've heard many women find this painful, but it didn't bother me.) Within a couple of hours I was noticing some regular-ish contractions. There was a department seminar at 4 pm, and during the seminar I just counted contractions. At the end I divided out and figured I'd been contracting about every seven minutes while I'd been sitting there. I thought the game might be afoot. I went back to lab and told Toby as much, and we decided that there were a few things we wanted to pick up that night in case it was the real deal. So we left lab, did some shopping, and got dinner. The whole time we were out I was contracting regularly, probably about 5 minutes apart but not strong. By the time we got home I was timing contractions about 4 minutes apart, still not strong, but I figured I should warn the on-call midwife. So we had her paged. The senior midwife, Kathy, was on call at the time. I talked to her, told her what was up, and we decided that I was fine at home for the time being. We also called to warn my parents then. They decided to head up but we said not to be in any hurry. Within about 10 minutes of making these calls I felt a pop. At first I thought it was my water breaking, but there was no gush. In fact it was the larger, grosser part of my mucus plug. Immediately my contractions became a lot more intense. Hello, active labor! So we called the midwife back and she said that the tub room at the hospital was free, so we decided to go in. We called my parents back and told them to go straight to the hospital. It was around 11 pm I guess. We arrived at the hospital and got into the room. The nurse started the initial monitoring strip, and while I was on that my water broke. So much for getting to use the tub! When the midwife arrived and checked me I was 4 cm dilated. I had back labor due to the baby being posterior. The contractions were still pretty manageable, but only if I was standing. So I pretty much paced all night, with DH providing counter-pressure as necessary. Occasionally when I got too tired I would try to sit or lie down for a few minutes, but the next contraction would have me back on my feet. At some point I found that I could lean my back against a door and produce the counter-pressure myself, and that was even better because I could press exactly where it felt best. My parents and youngest sister arrived around 3:30 I guess. I was able to chat with them between contractions. After this time I think I entered the labor time warp zone. Time passed, contractions continued. At some point I got in the shower for a while. I watched the snow outside. The sky got lighter. When the midwife came in and checked me in the morning at the end of her shift I was 8 cm dilated. I was worried I should be farther along but she reassured me that I was doing fine. By then I was getting very tired due to having paced pretty much all night long. I was really scared of transition, but it wasn't so bad. At some point I realized I was getting that desperate feeling I'd read about, and that the contractions weren't ever really letting up. I acknowledged that what I was feeling was probably transition, and that meant I was close to pushing. In all the birth stories I'd read pushing was described as a great relief. Pretty soon I thought I was feeling an urge to push, and I said so. The younger midwife, Katie, had taken over for Kathy in the morning, and she came in to check me. ("I guess that membrane strip worked!" she said.) I was nearly complete, just an anterior lip, so she said I could start trying to push. This was when I started having a bad time. Up until I started trying to push I'd really felt pretty in control. In retrospect, I don't think I was actually ready to push when I started trying to. I wasn't feeling that "irresistible urge" to push that I was told to wait for in class. As a result I spent two hours pushing unproductively. This part completely sucked. I was trying to push hard, but my contractions just weren't very strong then, so nothing much was happening. Everyone was yelling to push harder, harder, and I felt like I was trying as hard as I could. The midwife kept saying I was so close, I just needed to push harder. I felt like everyone was frustrated with me. Finally the midwife told the nurse that we needed to try some pitocin. I was terrified of pitocin. As that point I was exhausted mentally and physically, and the idea of super-strong contractions was unbearable. I just wanted to rest. I asked if they could give me something so I could rest a while, and was told no. Everyone was bustling around me then hooking me up to the IV, putting on monitors, everything. I was miserable, exhausted, and scared. I really didn't think I could make it. I was envisioning ending up with a C-section, after everything. But I should have trusted my midwife. Once the pitocin hit me I started having productive contractions, with that genuinely irresistible urge to push. I was still miserable, exhausted and scared, but at least I was getting somewhere. The midwife kept suggesting bringing in a mirror so I could see what was happening, and I kept saying no, but finally she ignored me and did it anyway. Again, should have trusted her. With the mirror I could see that she wasn't lying to me (which I had truly begun to believe), that the baby's head was right there, and I could actually see progress being made with each push. It was incredibly motivating! I could see her trying to stretch me around the baby's head. Oh yes, there was burning. And then, amazingly suddenly, he was through! What an incredible relief. He cried and cried, and was on my chest, and it was so wonderful. Nathaniel Morris was born at 12:33 pm on February 26, 2010. He weighed 9 pounds 9.6 ounces and was 22 inches long. His Apgar scores were 9 and 9. No one had suspected such a big baby! The midwives had been guessing somewhere between seven and eight and a half pounds. Kathy later admitted that they were surprised how big he was, but that it's hard to tell with posterior babies. He was balled up in a way that was hard to palpate, I guess! He was so large he exceeded some cut-off for "large for gestational age" babies, so the hospital had to track his blood sugar for the first day. Everything was fine, though. So, even though at the time I thought that my next delivery would be involving a lot of drugs, I am so glad that I was able to carry through with my plan for a birth without pain medication. And I now appreciate that pitocin does have its place! But mostly, I am so totally in love with this little boy that I know it doesn't matter how he got here, just that he made it safely. I hope to cloth diaper. This is no longer necessarily a matter of cloth rectangles and pins and rubber pants. Cloth diapers are technical now. You can get fitted diapers which are shaped like disposables and fasten with "velcro" (actually, hook and loop called Aplix or Touchtape) or snaps. You can even get all-in-one diapers that are like fitteds, but also have an integral waterproof layer, eliminating the need for a separate cover. These things can all be pretty expensive though. So I have been working to sew some fancy diapers for the boy. I started by trying to use a cheap pattern and easily available materials, but I was seduced by the online cloth diapering community. Snaps are better than hook and loop, they said, get a snap press. That pattern runs small. Just everyone uses organic bamboo these days. And so forth. So we arrive at Diaper 2.0. Think the boy will enjoy pooping on this one more? At some point indigo_rose99 made a comment that she saw a pregnant woman out in public, with a gapping shirt and, presumably, her belly hanging out. Yikes! Sadly, I am now that woman. I. Am. Huge. Most of my shirts, even my maternity shirts, now ride up and expose my belly. My belly coverage pants ride down and expose my belly. My belly refuses to be hidden. It is a force of nature. My belly has a mind of its own. It is entertaining just to sit and watch it roil, Alien-like, as the boy explores his tiny domicile. My ankles are swollen now. My hands are swollen, too. My hands fall asleep if I actually try to use them. Because of the swelling. There is good news! Because the boy has begun his slow descent, I can breathe much better. And the heartburn has let up. And the lower back pain has decreased. So that's all good. But the belly, it will not be getting any smaller. And I will not be buying bigger maternity clothes, not when I am considered "full-term" in a week and a half. So it will just be drafty between now and then.